Wow! I can't believe it is December! I think I'd better start my Christmas Shopping! I fell asleep sitting up watching 60 minutes last night, and didn't wake up and take my contacts out until 1:00 AM. I am exhausted! Too much sleep, and way in the wrong position! My neck hurts! Today, I am old! Yesterday, I witnessed an aluminum hatch on the Kilchis. I had predicted the water to be too strong, and indeed, too strong for me, it was. However, boat after boat passed me, as I fished from the bank. It's the late November drift boat hatch that we see, every year. They whizzed by me, at the speed of the Kilchis current! I'm sure they had trouble anchoring where the fish usually hold. I didn't see or hear much in the way of anything caught, but didn't speak to too many of them. They just sailed by, just as I'm sure my lure sailed by the fish, too! Since 5:00 AM, I have witnessed 7 drift boats heading up to the park. They are still coming, too! I think I'd better grab Kilchis and head out there. Believe me, I need all the handicap I can get, lately, to hook a fish. I think it's been over a week! I'm having withdrawal pains, and I'd rather add neck pain from casting, then to endure this feeling of lack-o-steel. I've got Stan's column up. I've got two cups of coffee in me, and I'm ready. Here, Kilchis! If someone were to ask me the most difficult thing about running ifish, I'd have to say "people appreciation management." I've always been the type of gal who has had one boyfriend, and one best friend. I think this is partly due to my visual disability, and partly due to being a bit of a loner. I've actually avoided large parties, because I have a fear of meeting people I've met before and forgetting their names, or hey, even their faces! When I'd play the piano in bars, I'd get stage fright. It wasn't anything about playing the piano, either. It was about people who would enjoy my playing, and come back, to hear me again. When someone drops $5.00 or $10.00 in your tip jar, they deserve to be remembered, but in the dim light of a piano bar, I couldn't tell male from female, let alone name, and face. So, if that person returned the next night to hear me, along with a dimly lit room of 150 others, imagine my horror, if they tapped me on the shoulder when I was playing, and I didn't know who the heck they were! I finally compromised, and acted as if I knew everyone, and turned on a smile and a hug usually reserved to those closest to me. It always felt kind of phony to me, but I had to, in order to cover myself. If one of those people had performed a kind deed for me, I was covered. I also joked with people who wanted to talk with me, on breaks. "I am nearly blind, can't remember faces or names, and if you want me to remember you, please touch me on the shoulder, get straight in my face, and say, "Hi Jennie, it's me, "John" and I was here last night, too!" That was funny, and seemed to cover it, but still, not ideal! In my family life, I've always been taught to write thank you's and appreciate gifts that people give. As a child, I wasn't allowed to play with Birthday or Christmas presents, until those thank you's were written. I am thankful for that tradition, because it helped me to associate the nice things that people did for me, and to remember their name and face, clearly. Imagine my horror, trying to remember 5000 or more ifishers! Sometimes, it keeps me up nights, like it did last night. Last Christmas party, in 2002, I had run out of camera batteries. A very nice gentleman came to the aid of my distress, and actually went to the store to get me some batteries! Now, I was in the midst of a bunch of people, had 10 zillion things on my mind such as putting up banners, getting hats ready to sell, telling folks where to put toys, and meeting a bunch of new ifishers that I knew by moniker, but not by face. However, this gentleman, in my mind, stood out as special. No one knew that I thought him special. He might have told me his name, but it didn't stand out against the 100 or so, others. It was a name, and I remember feelings, not names. The image in my mind, and his thoughtfulness was forever remembered. Wow! The guy went to the store, and wouldn't take money! Nice! So, later, someone by the name of "[email protected]" e mailed me. I failed to make the connection that this might be the gentleman who bought me batteries. I get over 100 e mails a day, besides the 100's of spam e mails. Which one of these random e mails that I have today, represent someone who has been especially nice to me? Who knows? This "whomever" could have easily also sent me a $10.00 donation, or slid over in his drift boat so that I could fish a slot, or who knows? This e mail address might represent a thousand people I have personally dealt with. But, the fact is, I dealt with him as I would anyone, without recognizing kind gestures. I wasn't rude, I just didn't put two and two together. I just answered his request, with business like professionalism. Later, I think it was Ifishstock that I met this gentleman again, and guess what? I didn't associate his face with his action. It was dark in Pietro's at the Christmas Party. I can't see in the dark. Heck, I can't even see in the light! Man, oh man, if I were to admire someone, and support their web site, or do something very kind to someone, I would expect darn well to be remembered. If they didn't, I think that my opinion of them would surely change. ..and so it seems to have happened with the gentleman that bought my camera batteries. Now, this is one isolated incident, but it happens all of the time. I wonder how many people I have written a personal thank you, and next time I met them, I didn't know who the heck they were. How can I solve this? I need to remember faces, monikers, names, e mail addresses, and heck, I may need to learn their new moniker, too, should they have it changed, on ifish. So, then, I combine all four associated identities, and remember which physical address on an envelope, belongs to which, should they send me a donation check, or order ifish decals and write a personal note that made me smile. Yeah, I can do that with 5000 or more people. Not. Say, that a member on ifish breaks one of the Acceptable Use Policies on ifish, purely innocently, and by accident. We write them a note, very business like, that addresses the problem, and asks them to fix it. I am dreaming of a new kind of palm pilot. One with some sort of GPS type technology that I wear on my belt, at all times. It tracks names, e mail addresses, physical addresses, monikers, and does a facial recognition scan for everyone I associate with. Everyone from fishers on the river, to ifishstock attendees, to people at Sports Shows who talk to me. When I come close to one of these people, it beeps if I have had any contact with them in the past, through e mail, physical mail, close encounter, or river encounter. I can simply glance down, and it will display the appropriate greeting. "Appreciative hug for buying batteries on 12/8/02" "Ignore for treating me rudely on river 9/05/02" "Smile for helping me catch a fish 7/01/01." And, of course, every time I meet someone new, I will fill in the data base, what happened, and when. Do they have one of these already, and I am missing out? It sure would solve a lot of problems. I'll tell you, I may have totally muffed it by not remembering the guy's name that bought me those batteries. I deserved it, when his attitude about me changed, and he posted something on the board that was unpleasant about me. However, that, I have decided to forgive and forget. I will always, however, remember the guy who was nice to me. That memory, whether he knows it or not, was not forgotten in my heart of hearts. That guy, is the one I'll remember and think back on, kindly. I can't tell you the number of times I smile out of nowhere, as I remember kind gestures that people have done for me. I often don't associate them properly. My wires get crossed, and I don't direct appropriate emotions towards the ones deserving. All I can do, is to try and treat everyone as if they have given their life for me. I guess you can't go wrong, smiling all the time. Sometimes, however, I wonder if people think I've gone nuts. "Who is that goofy girl, sitting in the boat, grinning at me? Who is she?" I'm really waiting for that new palm pilot, so I can just relax, and "beep" appropriately. I lay awake last night, wondering how many people I have not been thankful enough to. I wonder, how many people in my life have done things for me, and I haven't done enough for them, or somehow repaid their kindness. I thought a good night's sleep would render a fix, a lift, a different attitude. But, sleep didn't come, and now the feelings of failure have multiplied. "Tis the season of giving" as Christmas rolls around. I feel indebted by thousands of people and I have so many, many people on my Christmas list. So many e mails to answer, so many, many short jotted notes, that should have been more carefully constructed by me. So many abruptly ended phone calls, because I didn't have time to chat. I need to call them back. A blanket "Thank you" just won't do. You can bet your bottom dollar that I was on my knees last night, talking to God about an answer. I have faith that answer will come. Whether it be by palm pilot, or a gift of more hours in one day... peace, on this issue, will come! In the mean time, though... Sometimes it feels good to dream about going back to the days of "one best girl friend, and one best boyfriend." Now, that, I could handle. God answered my prayers! You know how? We had no power all day yesterday! It was WONDERFUL! Thank you Tillamook PUD!!!! I spent the day lounging, and fishing the Kilchis. When the lights came back on, though, whoa! I missed out on all kinds of drama. Thank you, God! I have out of town commitments today. Hope all goes well! I'd better take my laptop! Let me preface this by explaining.. When you open up the discussion forum, there is usually a partial header of the discussion topic, and the author's name. Now, that's an attention grabber, if I ever saw one! My eyes popped out of my head! I'll say it again, you just never know what you'll read on ifish! It's actually just the effects of neutering on lab performance, and the last post was made by Bill. I think I'll just continue to giggle and think of it the other way! By the way, take a minute and glance over the hunting forum members Trophy Page! Wow! The head picture is one I took of a buck that was out back, in the river. For more of those pictures, click here. I'll never forget that day! Let's see, shall I save Kilchis's life, or do I want the pictures? PICTURES! Ifish has kept me pretty busy this week! It has exploded yet again, for some reason! Just as I think we are leveling off, it's expands and membership increases, and, and, and... So much to read, that I can't keep up! I had to giggle this week, when I was out of town for most of the day. Upon return, Pete said, "I tried to read all 1000 + topics, but I'm not certain I got through them all!" What's up with that, Pete? Come on! Keep up! Anyone want a profreeding, prooorfeading, PROOFREADING job? November was a record month for ifish! Amazing, yesterday, with the storm winds predicted. I have finally figured it out! SE wind storms leaves the Kilchis canyon cool, dry, and still. Our high wind gust was 31 mph. However, most of the day, it was oddly still. If I looked way up on the hills, I could detect movement in the trees. But with southeast winds, I am protected down here in the canyon, and it was a perfect day for working a little, fishing a little, resting a little. Tonight we have SW winds predicted. I know those hit us hard, so it's time to take down the bird feeders, and prepare. 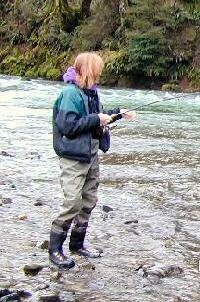 I'm still searching for this seasons first steelhead. I can't say I've given it much of a chance, but soon, I will be on a serious quest. I can catch and release chinook with no problems. I want steelhead! Sneaky little rascals! Bill wants me to go down the Wilson today, but with the Christmas Party coming up, ifish as busy as it's been, and Christmas shopping to do, I doubt the time is right. Now, listen to me. The time isn't right. What's up with that? Work to do? Does that sound like any fun? Bill, load up the drift boat! Let's go! Do you know that there are special muscles in your gluteus maximus for hanging outdoor Christmas lights? When I crawled out of bed this morning, I learned the hard way, that this is true. Yeowwwwwwww. Now, sore backside or not, my house is a patriotic display of red, white and blue Christmas lights! When you pass our home to launch your drift boat before dawn at the Kilchis Park, or, shuttle after dark in the evening, you will see them. A patriotic display, glowing like a neon flag against the night. I hope you pause, as you drive by, and remember the troops that are away from their families this Christmas, and say a prayer for them all. You know, I was a good Mom for young boys. We had a blast. We knew how to have a good time. We'd drag the plastic swimming pool into the living room in the winter, turn up the heat and lay beach towels around it and take a dip, pretending it to be summer. Like I said, we had a darn good time. My Mom used to say, "Jennie, these boys are going to grow up thinking that the whole world is their personal Disneyland." Goal reached. That was just what I was after! My life is still my own personal Disneyland, and I want others to live that way, too. Now these two little Brio loving, Lego building boys have grown taller than I, and their entertainment and friendship needs are far outgrowing my ability to provide. Thus, and quite naturally, they are seeking friends, rock and roll bands, sports, and, uh... dare I say it? Girls! -- to fulfill their social needs. Yesterday, I took David to buy dress shoes, black pants and a belt for his first "date". Yes, his first date! He refuses to think of it as such, and perhaps I am blowing it out of perspective. He insists the his gal friend is simply that. A gal friend. Perhaps I am the only romantic, here. She took him to dinner, and then, the winter formal dance, at the high school. I lay in bed, up later than usual, as his curfew of 11:30 PM slowly drew nearer. I counted the ticks of the clock. Andrew delivered hot chocolate to my bedside, somehow sensing my worry. Who is serving who, now? Who is caring for whom? I had to chuckle. David is Vice President of his class. He gets good grades. He stays out of trouble. Nonetheless, I nervously phoned a girl friend, who knows the gal David was with, better than I. I was assured she was a very responsible sort, good grades, involved in the Key Club, nice, etc. Sipping my chocolate slowly, and half watching a movie, the front door finally opened, and in came David, even before his curfew! "Hello David, did you have fun?" I said in an awkwardly calm voice, attempting to hide my relief. "Yes, Mother." That's all I got out of him. No story, no details, no... no nuttin. I have a lot of new things to get used to, I can see. Where it used to be long, drawn out stories of "what I did in school today." now, I get the shortened condensed, Campbell's soup version. Today, the sky is grayish black, and cold rain is coming down sideways. I'm thinking it would be a great day to get out the plastic pool and fill it with warm water from the sink. I used to have hose extensions for that very purpose. We'll pull out beach towels, make tuna sandwiches, (add a little sand for effect) and take a dip. I'm learning you have to approach teens in a different way. You have to be hip, grown up, and relate to them on their level. As we lay by the pool, Legos scattered around amongst us, and the heat up to 90, I'll just level the playing field, and ask David again. "So, Dave, how was your date?" "Hey, Mom, You know how your web site is pretty popular? That means that at least a couple of my friends may very well read your column." With that, he casually threw a wet towel at me. I think he's OK with my column, but I'm not sure. What do you think? The Christmas Party is tonight! I'm so excited! I am trying to find a couple volunteers to be 'meeters and greeters' at different time slots. Click here to see if you can help! Last year, I tried to do it all, and I didn't get to visit much. This year, I want to, to try and place names with faces, and see all of the toys! I went to bed early, woke up at 5, and opened my contact case to put in my eyes. Oops. No contact. Where are they? Why, still in my eyes! Oh no! That means, I can't wear them today! This might just be a good thing. This way, I can't possibly know who you are, unless you tell me! I have a big excuse! But, my eyes are swollen and puffy! This just won't do! Also, last night, I jammed my little finger into a cupboard. It stung, and I tried to continue cooking dinner. It had been one of those days, where I constantly hurt myself, fell down, and generally hurt all over. I tried to cut a potato. Couldn't move my finger. I tried to open a lid. Couldn't move my finger. I looked at it, and it was swollen to twice it's size. I think it is broken, and it hurts still! I have never broken a bone, so I don't know how it feels. I would never cancel, so, if you would like to be at Pietro's Pizza in Milwaukie tonight, at 5:00 PM, please bring an unwrapped toy, or one of the things on this list and join us! My brother David donated a truck from USF Reddaway, to ship the toys over to Emmanuel Children's Hospital. We have a contest going on, for an Okuma Epixor reel, to guess how many toys we will end up with. You may enter, here! I get to play, too, and I guessed 216! Somehow, I hope I am really low! I'd rather have more presents for the kids, than a reel!!! If I win, it's going to the kids! Lessee... what else? I am typing with my face two inches from the screen. Did I ever tell you how much I love my contacts? I think I'll give it four hours, and try to pry my eyes open to put them back in! Please, don't tell my eye doctor! The Kilchis river this year, is so odd and unpredictable! It used to be that I could calculate, from the rain, what it would be like. We got a bunch of rain two days ago, and I was sure the river would be totally too high to drift successfully. I was wrong! I woke up yesterday, and not only was the river full of boats, but it was beautiful! A little strong, but definitely fishable! Other times, we have had a bunch of rain, and the Wilson fished before the Kilchis! Last week, I glanced down at the river to check for color, and it was gorgeous. By the time I showered, got ready, and got out there, it had muddied up and was un fishable. Two hours later? Clear and gorgeous! There must be slide activity going on, up river. As Bill and I fished it, yesterday, I said to him, "Tomorrow will be perfect for drifting the river." I still hold that thought. It's dark out, but I can't wait to see if I'm right. I finally got my first steelhead of the season, out of the Kilchis, and was it ever a beauty! I swear it was all of 15 pounds! It was a bright, beautiful, fat and sassy football shaped hen! I took it on a pink and white (is there any other color?) First Cast Jig. I had it set at 6 feet, and let it swing in the tailout of one of my favorite drifts. On the last of the swing, it violently went under, and I got to see not only the bobber go down, but the flash of the fish as it took the jig. It was the perfect first fish of the season. I'm taken by the new method of using a long tubular inline weight, that Mark of First Cast is selling. Fixed, under a sliding bobber set up, you can't go wrong. And with that, the first trailer of the morning, is heading up to the park. I don't have my Christmas lights on. Gotta go do that. Toot Toot! Off to get ready for the party! Go catch a fish, and see you at Pietros! By the way, I think they should make a spell check tool with fishing terms already in it. I keep having to add to the spell check's knowledge base. Words like "tailout" "fishable," and all of the river names. Don'tcha think? Finally I feel the spirit of Christmas, thanks to last night's Christmas event! My kids are teenagers. That makes Christmas difficult, I have found. No more is it easy to buy something that brings them special happiness. Brio train sets, and Legos just don't cut it. A new bicycle won't, either. I find that I feel my most excited Christmas Spirit during this season, by fulfilling someone's greatest wishes. Last year, I was able to buy my son a bass guitar. It was something that I assured him I couldn't afford. But, I got it! My Visa card has suffered, but I did it! I lived through the preceding weeks with total excitement over that gift, knowing that I had fulfilled someone's greatest wishes! This year, I have been up nights, because I just can't figure out what to do to generate that excitement, for them, and likewise, for me. "Not having something cool to give... There's the teenage problem again. What do you get someone who is now too old for toys, and too cool to tell you what they want? Or if they do tell you, it's something like a new Mitsubishi Eclipse." Exactly! Bingo! You hit it on the nose! But, the void in my heart, where the Christmas spirit is supposed to be, has been filled! Last night, at the Christmas party, I cannot tell you how many times tears flooded my eyes. I could not walk through the room of toys, one more time. I had to keep my distance, or risk my makeup running worse than it had! I have never seen so many toys! We counted them! 803 toys and gift certificates and checks written! YAY! Someone is going to be very happy on Christmas! We did it! Not only that, but I was able to buy a gift for the moderators, who work very hard on ifish, and that made my night, too! "Oh! Jennie!" I heard, so many times. "You have done a wonderful thing with this Christmas party!" Well, perhaps WE have, yes... But perhaps you do not realize what I get out of it! I survive this Holiday Season by the full feeling in my heart, that this event provides for me and many others. Next time I see a TV commercial for prozac, or any number of those mood altering drugs on TV, I'm going to giggle. You don't need that stuff! Seriously, I know that medicine such as that is helpful to many people, but it's not for me. I just need a good holiday party, plenty of toys for the kids less fortunate, and I'm good to go! Just fill my prescription with "Toyzac"! We've come a long way in developing transportation, since crossing the Oregon Trail. My third Great Grandmother, Tabitha Brown, was one of the first woman to cross the Oregon Trail, and went on to found Pacific University. As I walked the rain soaked river, yesterday, I noticed the dead salmon on the river bank. Lifeless travelers, dead in the shallows. They colored the river bank. Chinook, chum, and silver carcasses, some of them two-together, wedged between dead logs, their flesh falling apart. Somehow, they are hauntingly beautiful to me, representing hardship, and success. Thoughts of crossing the Oregon Trail began playing in my mind. Images of what I have read in history books; thoughts of having to leave family members behind to die that failed to endure the journey. Lifeless bodies had to be left along the trail. Most of these fish, scattered across the rocks have completed their journey. But, how many are we missing this year? Our neighbors, who have grown up on the Kilchis river, often speak of days in mid winter when they couldn't open the doors of their homes, due to the stench of dead salmon carcasses that thickly covered the river beach! Now, they are scattered and few, in comparison. Talk about the balance of nature... Someone messed up, here! How can we have a balance of nature when only humans were gifted with a functional brain with the capability to grow and develop? We have brilliantly invented more efficient ways of travel and comfort. Who is responsible for giving humans the capability and brain power for caring for all of the world, and forgetting to fill us with compassion and equal brainpower to care and help sustain all of the earth and its wildlife? No longer do we have to endure cold nights under the stars, mid journey! We have bridges, highways, motels, restaurants, and every kind of aid needed, to make the journey from any point A to point B! Yet, in so doing, we have complicated and put at risk, the journey and life cycle of our fellow creatures. Driven by greed, I conclude, we have selfishly used our brains to advance only our own species, and carelessly left those less empowered, in jeopardy. Do we call this progress? I think not. As my pockets fill with litter left from careless anglers and campers, upstream, I can only shake my head in frustration. Pop cans, corkies, candy wrappers, bait cartons. I pick up an end of monofilament, follow it over a carcass, and begin ripping it out of the sand, until I reach the end, 20 yards downstream. "Cormorant nesting material" I hear the anglers joke, in my mind. I fail to see the humor. We, ignorantly, (or uncaringly, or thoughtlessly) dammed the rivers for our benefit. We built factories and mills and developed poisons that are destroying the very things that sustain us! Down come the trees that protect all of life, to build a house for one! What bothers me most, is that we are the only ones with the "brilliant" brains and power to fix things, and we aren't headed that way, at all. I feel like God gave us the ability and the responsibility to protect all things, and in the end, we have so failed, that we can't even sustain ourselves! This is a bitter and dark thought, but I do believe that we as humans could very well be on the road to extinction, if we don't understand the broad scope of our responsibility. Headed in the direction that we are, our "progress" will kill us! Does it have to come to that end, before the rivers will again fill with salmon, the trees full of singing birds, and the forests full again of old growth timber that shade the river banks, once again? It scares me to think that we, as people, will not make the sacrifices needed, to save all of our lives. Too many conveniences would have to be discarded and rethought, to include the full circle of life's survival. With that thought in mind, my deepest hopes and prayers are that we vote people into government that understand the choices we as people make, are actually life and death choices, rather than purely comfort, or economic decisions. We as people, each one of us, are caretakers of our earth. It's a long road to change, I know. However, if we don't begin accepting this immense responsibility, the consequences are those that nightmares are made of. I still have hope for our salmon, our streams, and our total survival. We have our own Oregon Trail to cross. It may have bridges, and motels, and comforts not seen, hundreds of years ago-- But it has life and death challenges to deal with, more than ever before. David Duncan says it much better than I. Guess what? I felt it! I felt it as I sang along, for the first time, to a Christmas Carol on TV! The Christmas Spirit! I did! I felt it! It happened! ...and now, it is here to stay, and I will not let it go! You can't push these things, you know. They just have to come freely. It's quite the same as that very first feeling of Spring Fever. I remember welcoming that light and airy feeling last year, as I was sitting silently on the front porch sipping coffee, on the first sunny day in May. All of the sudden, it washed over me! Pure joy! You can't ask for it, you can't cause it, you just have to be patient, and let it come! I've tried to force these things before. Those silly "Magic Eye" books, come to mind. Ever seen those? You have to stare into an oddly colored pattern in a book, and an image is supposed to pop out at you. Well, I've NEVER been able to see those. I have decided that only stupid people can see those, so I feel OK about that. I suppose if I tried not to, it would come.... but I gave up! The angels, and then the Hallmark Snoopy band ornaments that I put on the piano. Although they made me smile, they didn't quite do it. I saw commercials on TV. That didn't do it, either. I drove around at night, and saw Christmas lights.. Wait a minute, what was that feeling? Vague as it happened, it felt oddly familiar... Could it be? Nope. Not quite yet. Then, the Ifish Christmas party happened, and I felt it again. It lasted a bit longer, but then it was gone! Yesterday I woke up to an e mail from the lady at Emanuel Hospital, thanking us for our generosity in giving to the children in need. It hit me again! Flash! Christmas joy! But you know, I didn't relate it to Christmas! I just felt a wash of happiness fall over me. It wasn't until I was making dinner, that I realized it. Bill was home from cutting down the tree that I had picked out, and was bringing it into the house. A Christmas Carol was playing on TV, and I, without noticing, began to sing along. It wasn't until the second stanza. There I stood, chopping potatoes, singing along. I glanced into the living room and saw the lights on the angel that glittered against the night sky, and it came over me las if someone plugged me in! I do! I do have it! I have the Spirit of Christmas! It's a gift from God, really... a welcome feeling of joy and light, against the gloom and darkness of Oregon's rainy season. Dinner chores passed quickly as we sat down to eat, and admire the beautiful 12 foot, unadorned Christmas Tree that towers in our living room. The fresh smell of pine spread through our home, as I breathed in a new and welcome attitude. Oh! Thank you, God! I have it! ..and still, as I woke this morning, it remains! Last night, as I entered my bedroom, Kilchis and Molly Mae were laying on the bed, napping together. I had to run downstairs to grab the camera! As I snuggled in for an early long winter's nap, David came upstairs to visit. The rain was pounding on the roof. The wind was wild, and whistled through the cracks in the windows. I was safe and warm, as I snuggled under a down comforter in my new bed. 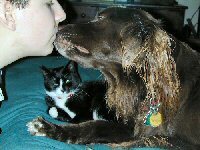 David, before he departed, kissed Kilchis goodnight, and as he walked out of the door he captured it perfectly as he said, "Merry Christmas, Mom!" The capture of Saddam! I hope this means things will get better, in a hurry! What a wonderful gift for the men and women who are serving our country! I don't know that it is the answer to all problems, but it certainly is a moral boost to know that we have Saddam captured! Stan Fagerstrom sent me his latest column. Funny, I know that these steelie tubes work. I tried them the very next day, after receiving a sample in the mail. Fish on! Read Stan's new column, here, and comment on it, if you like, by writing to Stan Fagerstrom. The slide up the Kilchis river is very upsetting to me. There is silt build up all over the chum spawning grounds. We took pictures of it, and the discussion takes place, here. Bill went up to find the slide, and took pictures, which I posted, here. I was amazed to read these facts, and converted this document to HTML and posted it, here. I'm not very politically motivated, usually, but when I see the damage done, right before my eyes, I want to know about it. Now, mind you, I've only heard one side of the story, and I have much to learn. However, the information I have gathered thus far is very disturbing. I will stay on top of it, and try to keep a balanced attitude. I have to catch up on Christmas shopping this week, and have done much of it online. It's nice to do that, but I need a dose of Holiday Mall shopping, don't you think? I may do that later this week, just so that I can say I experienced it! It's such a culture shock thing, when you are used to one lane roads, and one lane lines at Freddies! You know, in Tillamook, you can go shopping... once! Yesterday, as I hung yet another string of lights, David said, "Wow! Mom! You are going all out this year!" I guess I am, and I am enjoying it! The house is a beautiful, dazzling array of lights, and I can't wait to get up in the morning to turn them all on! Off to wrap some presents, and make out a couple more Christmas cards... Hope you have a wonderful Monday! I get to join the mass of Holiday Shoppers at Washington Square, today! Whoopee! I wonder if there is snow over the mountains? That always gives me Holiday Cheer. I'm going to take a CD of Christmas Carols to sing along with, on the way. Nothing more fun that leaving with a checkbook with a little bit of money, and coming home with none. What? Go buy bread and milk? With what? :) Settle down, kids, we are having candy canes for dinner! You can wash them down with a little egg nog! The river here on the Kilchis is blown out. I think I'll take a rod along and fish the Wilson a bit on my way over the mountain. I wonder if I'll ever make it to the mall. I had a great time Holiday Shopping! Pete was nice enough to help me drive around, and answer questions like, "Would Bill like this? Would Andrew wear this?" I found a stocking cap that was made to look like Kermit. I loved it and thought that Andrew would too. Then, I started to doubt, and put it back. When I got home, I asked Andrew. He said, "Now, that, I would have worn!" I KNEW IT! Maybe I'll go back and get it! I should stick to my Sesame Street instincts! I was amazed to find the Kilchis slide story on the front page of The Daily Oregonian: Slide Stirs Logging Debate. I'm so glad that we took the effort to get up there and see what was happening. I can't help but think that ifish played a role in getting the news out. Whether it was mad made or natural, (This is a funny Freudian typo pointed out to me, and I think I'll keep it!) we don't know, at this point. I'm glad it's being looked into. What is interesting to me, in their picture, is that you can see a very tiny white speck about an inch and to the left, below the top of the slide. That is the spring. So, the slide started above the natural spring. The most upsetting part of the article for me, is the prediction of how this will hurt chinook salmon runs. That is precisely what I worry about. People like to tease me that I'm just worried about fishing for steelhead this year. Not so. In fact, I'm going out this morning. The Kilchis is looking pretty good at this moment. However, whenever it rains, it muddies up quickly with fresh debris and silt. I have been able to tell something was different all year long. We used to be able to predict the Kilchis to clear quickly after high water, and long before the Wilson. This is simply not so, in 2003. Bill went out fishing yesterday, and noted a 40 plus pound chinook, barely clinging to life in the shallows. He took out a measuring tape and held it close to its slowly finning body. 45 and some, inches. Wow! Anyway, Bill got a head shaker bite, before a boater came down and, I guess didn't know the water. The oarsman rowed through the good holes, and fished in all the wrong places. Bill got a little frustrated and gave up for the day. How many times do I see this happen? A lot!! It's just the way it goes, I guess. Anyway, I'm home for the day, and so glad I am! I have tons of presents to wrap. It's strange how you have to make sure that presents are of equal value, both monetarily and in "fun" value. Whether it is imagined, or not, I have a fear that on Christmas morning, the boys will compare. They never have, to my knowledge, but it's something that I am acutely aware of. You buy the boys socks, and books, etc.. Things that are the polite, "Oh, thank you" kinds of items. You know, the necessities. Then, there are the fun things. Toys and games, and candy canes! I have to keep a running tab, and check it twice as I wrap. What never ceases to happen to me, is that I say, "Oh! Andrew is short on the fun factor!" So, I run back to the store. I get home and recalculate. "Oh no!" Now David is short on the polite, "Oh! Thank you" factor! Back to the store I go. Pretty soon, I am dead broke, and I am personally short on all factors! I know, personally, that Christmas is all about the joy of Christ, and my hope and prayers are that my children do, also. Somehow, however, it was instilled in me as a child that you can not fail your kid's expectations at Christmas time. There must be intense personal joy, also! You can do this on a budget, but it's not easy! It takes much personal sacrifice and planning. Well, I'm sacrificed and planned out, at this moment. Time to "wrap it up". There is a special kind of Christmas joy that I feel when I leave the store for the last time. I shout out, at no one in particular, "I'm done! My list is filled!" I just love the look on other shoppers faces, who have only just begun. It's as if to say, "Well, aren't YOU special?!" I know how that feels, because I'm usually the last one! I just wonder how many more times Fred Meyers will see me, before Christmas. You know, just balancing things out. I love warm wooly socks and my Exotherms! I love new pajamas! When I was at Nordstrom's Rack the other day, I found a new pair of pajamas, and now I never want to get dressed, again! I love stormy nights in pajamas, with a down comforter and a cuddly soft dog friend at my side. Add to that, the warm lights of a Christmas tree, and a good movie, and you have paradise, as I see it! I love taking walks beside the Kilchis, after the salmon season is over, and the steelhead start to come in. When the water is low, you can watch the chums spawn in the shallows. I sit on a clump of grass, as Kilchis digs a hole beside me, and watch their behavior for hours. I can't help but think that the river knows when salmon season is over. It cleanses itself. The water levels raise, many times, as if to flush itself of any trace of humanity. The banks are clean of bait containers and corkies. Even footprints from the shoreline are whisked out to sea. Water rushes down from snow melts, high in the mountains, and floods the bank. At it's highest, lower branches from huge towering trees dip into the water, as if scenting it with the oils of alder and fir. When it recedes, the sands along the river are exposed, smooth, and fresh. There is nothing more lovely than having my footprint join the only other footprints on it's slate. That of a deer or elk, or those as delicate and lacy as the tiny prints of a racoon. Sometimes I race Kilchis to the beaches, just so that I can be the first to the sand. December, January, February. These are the months that breath fresh to me. It's no wonder that I adore steelhead fishing. I've always preferred being alone on the water. Although I do love the salmon season, the prospects of bobber downs, and the ensuing battle that follows, it is not until steelhead season that I feel the real connection that the river first brought to me, years ago. I was introduced to fishing by my Dad, and back then, the river was a lonely, quiet place where we seldom saw another soul as far as you could see. As I played between the huge boulders on the Sandy river, the music of the water blocked out all thought.. I was introduced, then, to a special feeling that only the hush of steelhead season brings back to me. I can't fully connect that feeling during salmon season, nor during summer fly fishing. It's found only in the heart of the quiet, still morning on the river in the dead of winter. All of my senses tumble together and childhood comes rushing back to me with innocence and wonder. After a day on the river that brings me all of this, what could be better than a warm fire, a cup of cocoa, and new pajamas? It is then that I am ready to visit with my family, to share a warm meal, and look so forward to my next day on the river. Christmas may be for kids, but so is winter. I can put all of the business and social contacts of a work day behind me by simply noting my solitary footprints on the Kilchis river beach. It is then that I feel my childhood and all of it's freedom come rushing back to me. Merry Christmas, and may all of these feelings come to greet you on the river, this winter season. Simple Pleasure of the day: You know, I just love going to town without my dog, Kilchis. I stayed at Fred Meyer's way too long, spent way too much money, and didn't have to worry about him being in the car, overheating. Then, I drove to McDonalds, ordered a one dollar sandwich, and ate it all by myself, with no beggars in the back seat! Then, it was home to play with toys. I got out my Luhr Jensen Hot Shot Planer. I had it out the last couple of days, and just couldn't get it to work correctly. So, I brought it in the house, and finally found this link. It was rather eerie, as this is Don Larson's web site. I felt a connection with him, yet again. Don passed away last year, on the Columbia river, while fishing. His boat was found floating, without him. I'll not forget our first sturgeon trip together. Anyway, I finally rigged it right, and was ready to go. I'm just in love with this pink Brad's wiggler that I have. I cannot tell you how many fish I have nailed on this particular plug. It's metallic pink, and I can't find it on BS fish tales, but I will be calling them later. I lost my "Wee Wiggler" in the same color, in that last danged hole on the Wilson, before the takeout. That hole looks extremely fishy, but I have donated more plugs there than I care to admit! I keep promising myself, that come summer, I will wade up there and get all my favorite lures back! I decided I was going to use my planer and my wiggler to attack the fish on the Kilchis. I know, it's kind of cheating, but I don't have a drift boat, so this little planer would be my boat for the day! It worked flawlessly, once I had it set up! I worked every inch of the river, and some places that I wouldn't be able to hold anchor, with a drift boat! No, I didn't even get so much as a bite, but I was sure that I was using it correctly, for the first time in my life. I really had a great time! You could easily plunk fish, with this thing! I wished I had a rod holder. 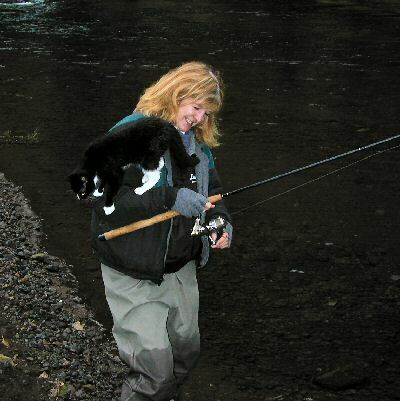 Instead, I held the rod steady with my arm outstretched, while Molly the fishing cat, crawled down onto my arm, and preened herself, sitting in the crook of my arm. Now, if you think you might get sore holding your arm that way for any length of time, just add the weight of a cat. My neck is immobile this morning. Thanks, Molly! Still, she is so darned cute, I can't tell her to get down. It's funny how the cars that speed by on the road, slow down to see if what they thought they saw was really what they thought they saw! Some even back up for a double take. "Yes, that is a girl fishing with a cat on her hat, arm, or shoulder. Yes, it is. It is a cat!" I had one guy, up above and on the logging road across the river, actually get out and take a picture. Molly is very unique and I love her so much! A fishing cat. Now, there is an animal I can use! Anyhow, I'm going to do it today, again... the planer thing. First off, though, the deadline for the ifish custom Kwikfish is drawing near. So, I have to make some decisions here! Off I go, the light is spreading over the Kilchis Canyon, there are fish to be had, and a few errands to be run. Have a great day! 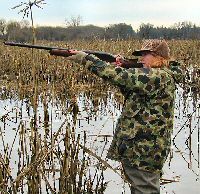 Yeah, me duck hunting... Right! Look out! and Jennie was playing her favorite Christmas music, before the light of day spread across the Kilchis Canyon. I have two favorites.. The Mannheim Steamrollers, and believe it or not, The Carpenters Christmas Album! I always enjoy going back on Christmas to read a story that Stan Fagerstrom wrote for Ifish. Today, the boys and I have lots of work to do, as part of a present for Bill. I can't tell you about it yet, because Bill might read it. But, I will, very soon! Went out yesterday with a pink jig. The water was low enough to hit a spot in the river that always holds fish of every species. Three chinook later, my arm was tired, and remains so! Pink jigs for salmon are really the ticket! Yesterday morning I joined Bill on a duck hunt. He let me shoot at some mistletoe. Yip. Mistletoe. Not a duck flew all day long. Well, we did see two pintails, but they were too far off. What was very interesting, however, is that Kilchis, although untrained, has some very birdy instincts, and did very well. He was well behaved, quiet, and alert. He seems to know the command, "Mark!" without any training. He searches the sky and gets all excited. We all had a great time. I doubt that I'll ever hunt due to my eyesight, but I enjoyed the morning in the out doors. Funny, Bill hates to plunk while fishing. I found duck hunting very similar to that plunking feeling. Sit and wait, sit and wait, sit and wait some more. I told him the bite was very slow. He agreed. On the way there, I asked him, "Bill? What color of lipstick attracts ducks?" He told me green. I don't have any green lipstick, therefore, there were no ducks. Anyway, I've got a busy day planned. A day full of good food, great company, and a warm fire in the fire place... Perhaps a small fishing trip, in between! This morning came to a crackling start with thunder and lightning striking very close to the house. What an entrance to the power and glory of the birth of Jesus Christ! Wake up! Jesus Christ is born today! I woke up to a light, clean dusting of sleetish snow this morning! Christmas was a bit odd yesterday as far as traditions go. I have never, until yesterday, missed a Christmas family gathering. Yesterday, I did. We drove halfway up the mountain, and turned around. Not because I didn't think we could make it, but because the return trip scared me, a bit. I felt sad, and had a touch of guilt for a while, until I checked the road web site, at about the time I would be returning. It said, "Black ice." I was glad, then, that I hadn't chanced it. There was also a terrible accident at the very time I would have been returning. So, yesterday found me on the banks of the Kilchis river. I caught a beautiful bright red Coho ho ho on my planer. OK, I can put away my planer now. I caught a fish on it, and my curiosity is satisfied. Next? My fly rod. I got a sink tip line from Santa, and Santa wants me to get a steelhead on a fly, now. You know, I really despise tackle bags, and boxes. Instead, I fill my fishing coat pockets with everything I need. I have a jig coat, a tackle coat, a fly coat. Every one of them has standard pliers, and then whatever else I need for that style of fishing. Bill gets very frustrated with me, because when I decide to go fishing, I just grab my coat and go. His remarks are mostly, "What? You are ready? Wait for me!" Wait, I don't. He takes forever to get ready! While I am on the river casting, he is back at the house, tying up rigs, filling his tackle bag, and coffee cup. I just like to grab my coat and go! Of course, when he finally does arrive, he usually has whatever it is that I might have forgotten, or need. Yesterday, between cups of hot chocolate breaks, I grabbed my coat to go just for a few minutes. I had grabbed a dual purpose coat, full of miscellaneous fishing goods. All I cared about was pliers, since I knew today was my day! I grabbed two rods, my jig rod, and one rigged with a planer. When I got down to the river, I noted several dead salmon in the shallows. All of the sudden, my nose filled with the most pungent, disgusting smell I had ever smelled! Ugh! It was rancid! I moved upstream, to get away from whatever dead and decaying salmon was putting off the aroma. The smell seemed to follow me. It only was worse! I stood and felt the direction of wind. It was calm, and still. "Kilchis! Here, Kilch!" Maybe Kilchis had rolled in the smell. I sighed, knowing all too well how difficult it is to get a dog clean and smelling good, after rolling in filet of dead salmon carcass. Thoughts of spending the rest of the afternoon bathing Kilchis were not pleasant. I moved yet further upstream, to get away from the stench. Again, it only got worse. I smelled my gloves, which I hadn't washed since the last fishing trip. I did this several times. Nope. Gloves smell fine. It wasn't until I leaned over to pick up an agate that the truth became disgustingly clear. As I leaned over, a deadly toxic liquid seeped out of my jacket pocket, and onto my hip waders. What is this liquid? Where is it coming from? All of the sudden, the smell completely overwhelmed me, and I nearly passed out. A partial critter that once was a sand shrimp fell lifelessly from my pocket and stuck to my hip waders. I reached into that pocket, and found a styrofoam container, barely cracked open, and full of dead, disgusting, rotting shrimp. Pete had brought it over, a week ago, last I wore this particular fishing jacket. I kept it there, thinking I would just run in the house to make a phone call, and come back out to fish. I think I got side tracked for a couple days by my new toy, the planer. While Bill may take a little longer to get ready to fish, and while I feel impatient, waiting for him, I think there are some benefits to his careful, predictable, and organized ways. I am learning some of the benefits of the "Bill school of organized fishing" ...and some unfortunate things about the slow decay of sand shrimp. I didn't mind the red and pink streaks of salmon egg juice that lines the pockets of this tackle jacket so much, or the fish scales stuck to the upper arm... The wadded up old plastic gloves in the pockets and assorted weights and slinkies didn't bother me, either. The hooks impaled in the lining of the pockets are a hassle, but this terrible smell marks a fresh start for this particular tackle coat. I think I have some laundry to do. But because I know that this would be a simple thing to do, I am going to ask! Father, I so want to wake up to the hush of a snow covered valley. I would like to see tree boughs, weighted down with soft white snow. As the day wears on and the temperatures rise, I want to see them falling to the ground, the muffled sounds echoing across the meadow. I want to listen for birds that have come to my feeders for difficult to find food. I crave that softness, that peaceful silence that only snow can bring to the canyon. The kids are home from school, God, and we have a new sled that has never been used. It's been sitting in the attic for three years, while we wait for this special treat. I don't know who wants it worse, God, the kids, or me, (I think it's me!) but I'm sure that I could get them to crack a smile over it, too! I know that there are so many, many problems in the world that you need to help people with. The devastated people in Iran, the starving children everywhere, and people who are sad this Holiday season, and feeling alone. Knowing all of this, and troubling you for this small request humbles me, Lord, but... if you have time, I just thought I'd mention how much it would delight me. You know that, don't you? Lord, thank you for all of the blessings you have brought my family this year, and thank you for taking care of each and every one of us. As the light enters the sky, I can stare up into the vast mountain of trees that surround me here in the Kilchis Canyon. I see that just 500 feet up, you have graced the trees with exactly what I had in mind. It's so close, God! Anyhow, it's not an important thing that needs your attention, but it's a small request from me to you. Alright, so how do I write, today? Yesterday's "Jennie's Fishing Life" column was a prayer plea for snow. I didn't get snow. I used to have a graphic that said, "Jennie's Fishing Life." I tend now to be thankful I took that down. I fish a bunch, but not always. That leaves me available to write a snow prayer, and be alright with it! I woke up this morning to a blanket of wet, sopping cold grass. Not a hint of the frozen stuff that I talked to God about. Last night on the news, they said 'no snow to the valley floor' for last night, but gave as much as a Oregon Weatherman's promise of snow for Sunday night. (Tonight!) Well, we all know about Oregon Weather people's promises! The forecast today says, "Warming". Uh huh. Alright, no sour grapes, here. I know that there is a good reason that we will have no snow on our valley floor. I just don't know what it is. After all, what I have learned about prayers thus far, is told in one of my favorite songs, "In His Time." And... I know that our valley floor will be inches deep in snow, In His Time! I can't tell you the number of times that song runs through my head through different times in my life. I always want things NOW! Funny though, if you keep a prayer journal and review it, most things do get answered, but only In His Time! I can wait! And meanwhile, I'll just gaze at a picture of our house in the snow, and remember! Want to see? Click here for the 2000 storm! See! It can happen, and it will!! In His Time! Meanwhile, I'll count my blessings, get in the car and go find some steelhead, today. Bill is going to go with me. We are going to stop in and visit our old church, go to Costco, and explore some North Coast rivers up North that have missed us lately. I hear there are a couple steelhead with our names on them, and they miss us, too. I find it almost ironic that I had plans to meet a girlfriend at Shilo in Lincoln City to catch up on girl talk. We were going to have dinner and talk, go shopping and talk, and talk, and talk and talk! She cancelled, due to the snow on the passes. I was really looking forward to it, and it is the third time that we have had to cancel our "get away from kids" plans. Well, I guess you can say my snow prayers were answered in a way. Just goes to show, you gotta be careful what you pray for... and perhaps be very specific about where you want snow. Just remember, it doesn't always happen on our schedule. It is In His Time. ... And I think I know why! If I woke up to it as a surprise, it will be all the more fun! The reason that we decided to go North, yesterday, was due to the weather. We thought it was going to be another really nasty, hail pounding day. When we realized it wasn't going to be that bad, we decided to drift the Kilchis. Kilchis the dog wanted to go too, but we had too many rods in the boat. Instead, I told Bill that we'd have to run him a bit, before we left. I grabbed my jig rod, and headed down to the river, a wagging tailed Kilchis, along side. I threw out a pink and white jig, and down she went with the power of either a huge steelhead, or a salmon. This take was so powerful that it nearly grabbed the rod from my hand. Let me tell you something. I have marfan syndrome, which make my muscles really weak at times. My hands cramp, and if I overextend, I pay in pain, for a week or more! But, I'll tell you, when I have a big fish on the end of my line, I forget all of that. This, is why I love to fish so much! I forget about everything! This fish took off downstream with power that I hadn't felt in a long, long time. Down the river, and through the shoot. What could I do? Run like I was an Olympian! That's what! My feet stumbled over the rocks at a faster pace than I thought possible, and still I stayed upright! Now, that is a miracle, with my unsteady gate!! I had 10 pound test above that jig, and if I didn't keep up, I knew that nightmarish snap would sing out for the world to hear. "Bill!" I yelled downriver, where Bill was messing with the drift boat. The fish was behind a rock, and holding steady at this point. I thought I was going to lose him. This is when thoughts of badly tied knots run through your mind! "Did I or didn't I tie a good one?" Was this the monster steelhead of my dreams? Finally, after three hard runs I brought it in. One of those pesky December chrome chinook again! Dang! It seems the lighter the gear I use, the harder I try to attract only steelhead, the more I run into these broad shouldered, purple hued spotties! There may be a tip in here, somewhere, if you are targeting chinook! Now, if you'd please tell me how to target steelhead, I'd love it! I've only landed two this season. But salmon? I've lost count. I let the beautiful creature go. My freezer is full! I had fun, though. It was the only fish we hooked, all day. The river was quite crowded down from the logging bridge, and all the good holes were plugged. We pushed through and took out, without working the water very hard. I'd say the most excitement we had, was when I snagged up my very special Hot N Tot, in swift water, and finally retrieved it with the net. We had trouble staying on anchor, and nearly lost the net and a couple rods, trying to get it loose. I got it! I was more pleased with that, then anything! I am paying dearly for that salmon. My hands, my shoulders, and my legs are wiped out. I feel like such a wimp! All I have to do, though, is to look at the pic, remember the fun, and know it was all worth it. I will heal. I always do! Maybe I just need to get out there and try it again. Maybe it will limber me up a bit. It's all in the name physical therapy. My doctor ordered it. Didn't he? I use Power Pro on my 1143, with an Okuma spinning reel for fishing jigs for steelhead. It works like a champ, and Stan Fagerstrom is here to tell you the same thing! Click here for more. Just the other day, I landed a nice chrome bright chinook, on this very set up. It's nice to use the braided, for this time of year. I find that the added strength of braid is good for when I want to get a fish in quickly, for a safe release. The world outside is a block of ice, all except for the river. That's where I'm headed, right now. I've been working for a couple hours. I added a new sponsor to ifish! Welcome to Konezone, high vis Trolling Flashers! They are found in the specialty tackle section on ifish. I will be giving away some "ready set" Flashers on the board, very soon! Just in time for the upcoming season! Off I go, only one more day to play with the late, bright chrome chinook. I really want a steelhead, but hey... I can't be too picky. You know? Maybe tonight... it will snow. Right? psssssssst! You guys? It's snowing!!!!!!!!!!!!!! Get out the sleds and the hot chocolate! Just thought I'd pop in and say, "Oh, snow! Oh, snow! Oh, snow!" Please? You know, my post mistress, whom I refer to as my Angel said, "Well, Jennie, you have to realize that every time you pray for something like that, you have to realize that others are praying against it, so that they may travel." So, I guess I'll just pray that no one wants to travel anywhere, anytime soon!